The Snowy Mountains Hydro-Electric Scheme is by far the largest engineering project ever undertaken in Australia. It is also one of the largest and most complex hydro-electric schemes in the world. The system's construction is seen by many as a defining point in Australia's history, and an important symbol of Australia's identity as an independent, multicultural and resourceful country. The Snowy Scheme is also considered economically important for Australia. It supplies vital water to the farming industries of inland New South Wales and Victoria. The system's power stations also produce up to ten per cent of all electricity needs for New South Wales. This makes it one of the most complex hydro-electric schemes in the world. Only two per cent of the entire construction is visible above the ground. The entire scheme covers a mountainous area of approximately 5,124 square kilometres in southern New South Wales. The purpose of the scheme is to collect water from melting snow and rain in the Snowy Mountains. Where once most of this water used to flow into the Snowy River, it is now diverted through tunnels in the mountains and stored in dams. The water is then used by the power stations to create electricity. Find an overview of how the scheme works on the Snowy Hydro website. The water then flows mainly into the Murray and Murrumbidgee Rivers. These rivers are important for irrigation of farms and for household water for communities in New South Wales, Victoria and South Australia. A small proportion of the water flows into the Snowy River. Work on the system started in 1949 and was finished in 1974, taking twenty-five years to complete. The entire project was completed on time and to budget, costing approximately A$820 million. At the launch of the project, the then Prime Minister Ben Chifley presented it as a national milestone - important for the drought relief it would bring to inland Australia, the power it would supply and for the ambitious size of the project. Because the project was so much bigger and more complex than anything that had been done before, the engineers needed to develop methods that were new to Australia and the world. Safer and cheaper construction techniques were created and the project set some new standards in occupational health and safety for the time. The power stations adopted higher outputs of electricity transmission than ever before. The project used Australia's first transistorised computer, which was also one of the first in the world. Called 'Snowcom', the computer was used from 1960 to 1967, contributing greatly to the efficient and successful completion of the project. More than 100,000 people from over thirty countries came to the mountains to work on the project. Up to 7,300 workers would provide their labour at any one time. Seventy per cent of all the workers were migrants. They came to Australia to work on the project, attracted by the relatively high wages. At that time, soon after the Second World War, work was hard to come by in Europe. At first, most of the workers were men who had left their families at home in Europe. Their plan was to work hard, save money and bring their families out when they could afford to. The work was hard and the conditions were tough. 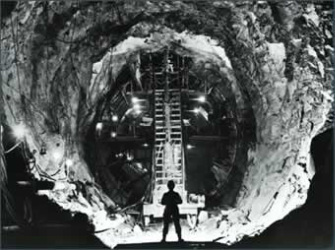 Because ninety-eight per cent of the project was underground, there was a lot of tunnelling, often through solid granite rock. Work in the tunnels was dirty, wet, noisy, smelly and sometimes dangerous. More than 120 workers died in the project's twenty-five year period. Living conditions were also hard in the camps and towns built in the mountains to house the workers and their families. Often these dwellings were not suited to the freezing conditions. They were cold and the water would freeze in the pipes. When the workers' wives came to join them in the townships, these women had to work hard to overcome the hardships and establish communities in the strange, new, wilderness environment. When work in one area was completed, the dwellings were dismantled and moved to another area, so very little remains of these towns today. The majority of the workers stayed on to live in Australia after the project was completed, making a valuable contribution to Australia's modern multicultural society.